Why Do We Need Selections In Photoshop? As you may have already discovered on your own if you've read through any of our other Photoshop tutorials here at Photoshop Essentials, I'm a big fan of "why". Lots of people will happily tell us how to do something, but for whatever reason, the why is usually left out, forever limiting our understanding of what it is we're doing. Take selections in Photoshop, for example. There's no shortage of ways to select things in an image with Photoshop. We can make simple geometric selections with the Rectangular Marquee Tool or the Elliptical Marquee Tool, or freehand selections with the Lasso, Polygonal Lasso or Magnetic Lasso Tools. We can select areas of similar color or brightness values with the Magic Wand or Color Range command. We can paint or refine a selection manually with a brush in Quick Mask mode or by using a layer mask. We can make surgically-precise selections with the Pen Tool, and more! We can even combine different selection methods when none of them by themselves seem to be up to the challenge. None of this, however, explains why we need to make selections in the first place, so in this tutorial, we'll take a quick look at the "why". This won't be a detailed explanation of how to make selections. We'll save that for other tutorials. Here, we're simply going to look at why we need to make selections at all. Red, delicious apples. Unless of course, you don't like apples, but who doesn't like apples? Obviously, the main subject in the photo above is the apples, right? But why is it obvious? How do we know that we're looking at apples? 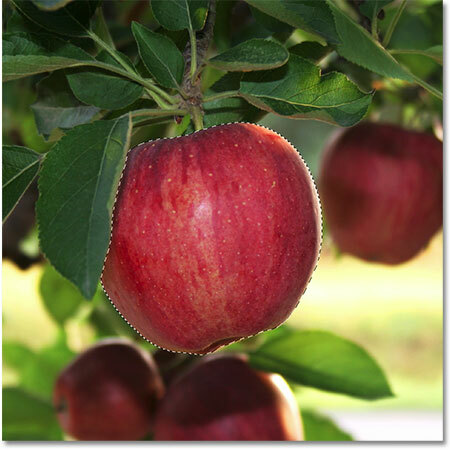 We know because most of us have seen enough apples in the past that we can instantly recognize them. We know their shape, their color and their texture because we've seen them before. We could even point to each apple in the photo if someone asked us to without mistakenly pointing at a leaf or something else that isn't an apple because we have no problem distinguishing between all the different objects in the image. We see things with our eyes and our brain tells us that this is this and that is that, and this is not that and that is not this. In fact, even if we had never seen an apple before, we could at least point to all the objects that look relatively the same. We're so good at recognizing and identifying objects that we usually do it without consciously thinking about it. That's great for us, but what about Photoshop? Does Photoshop see the apples? 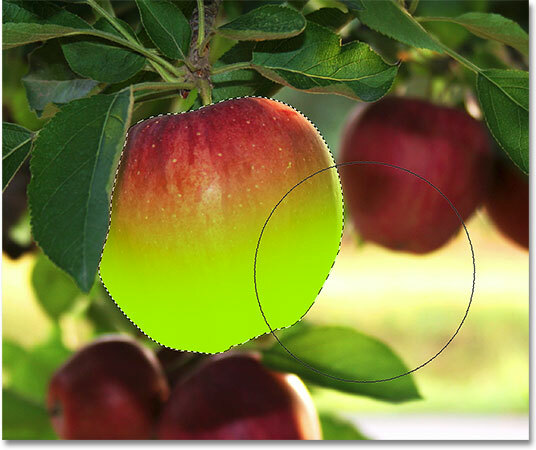 Does Photoshop recognize their shape, color and texture as "apple"? Can it point to all the apples in the photo without confusing an apple with a leaf, or at least point to all the objects that look the same? A close-up view of the edge of an apple showing that it's really just a bunch of tiny square pixels. What this unfortunately means for us is that we can't simply click on something in a photo and expect Photoshop to instantly select it for us because what we see as separate and independent objects, Photoshop sees as nothing but different colored pixels. So how do we get around this little problem of miscommunication? Well, since we can't expect Photoshop to think like us, we need to think like Photoshop. We need a way to tell Photoshop that we want to work on these pixels here but not those pixels there. 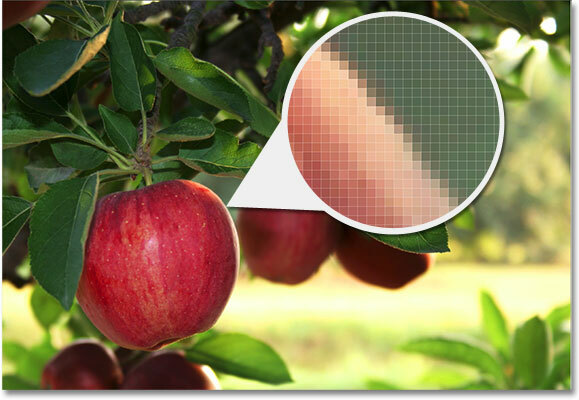 We can't tell Photoshop that we want to change the color of the apple, for example, but we can tell it that we want to change the color of the pixels that, to us, make up that apple. We do that by first selecting those pixels in the photo, and we do that by making... you guessed it... selections! So far, we know that we see things very differently from how Photoshop sees them. We see independent, recognizable objects while Photoshop sees everything as pixels, and we tell Photoshop which pixels we want to work on by selecting them with one or more of the various selection tools. 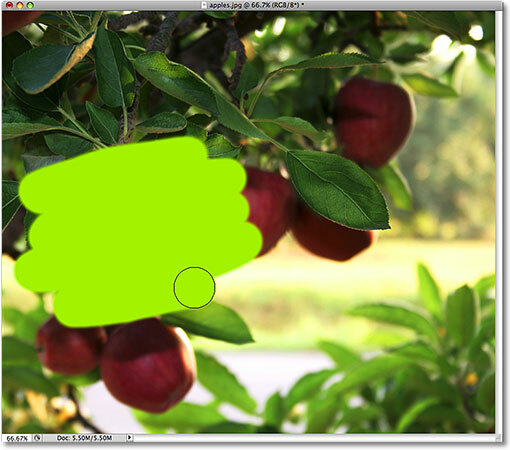 In fact, before we can do anything at all to an image, Photoshop first needs to know which pixels we want to edit. Photoshop paints with the current Foreground color. 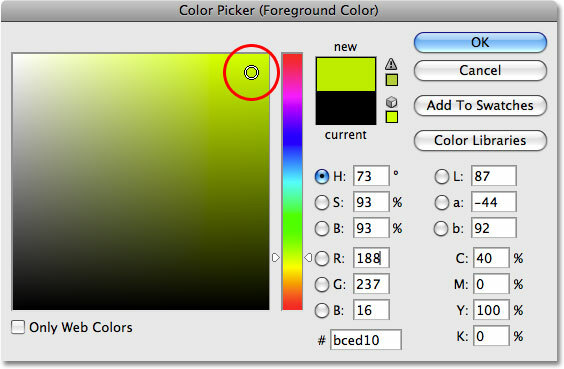 The Color Picker is the most common way to select colors in Photoshop. Ultra-realistic photo effect. Expert users only. Wait a minute, what just happened?! I was able to paint over the apple! Photoshop didn't complain at all! Okay, let's recap. I said we can't do anything to an image unless we first select the pixels that we want to edit. Then to prove it, I grabbed my Brush Tool and tried painting over part of the image without first selecting anything, yet I was still able to paint over it. This can only mean one thing... I have no idea what I'm talking about! Seriously though, the real reason why I was still able to paint over the apple without first selecting any pixels is because of a little known fact. Whenever we have nothing selected in an image, we actually have everything selected. Photoshop assumes that if we didn't select any specific pixels first, it can only be because we wanted every pixel selected so we can edit the entire photo. Or at least, we have the option to edit the entire photo. As we saw in this example, I was able to paint over just a small area of the image even though I didn't select any pixels first, but if I wanted to, I could have just as easily painted over the entire image and there would have been nothing preventing me from doing that. While having the freedom to go where we want and do what we please sounds wonderful, it can actually be a very bad thing, at least when it comes to photo editing. In this example, all I wanted to do was change the color of the apple, yet because I didn't select the apple first, Photoshop allowed me to paint anywhere I wanted, and all I ended up doing was making a mess of things. Let's see what happens if I select the apple first. I'm going to undo the paint strokes I added to the image by pressing Ctrl+Z (Win) / Command+Z (Mac), and this time, I'll select the apple first before painting over it. As I mentioned at the beginning of this tutorial, we'll save the details of how to actually make selections for other tutorials. For now, I'll simply go ahead and draw a selection around the apple. Selection outlines appear as animated "marching ants". 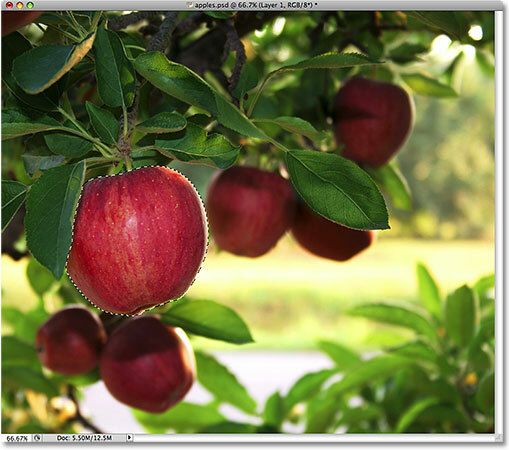 Of course, to us, it looks like I've selected the apple, but keep in mind that as far as Photoshop is concerned, all I've done is selected some of the pixels in the image. They just happen to be the pixels that make up what you and I see as an apple. The pixels that fall within the boundaries of the selection outline are now selected, which means that they can be affected by whatever edits I make next, while the remaining pixels outside of the selection outline are not selected and won't be affected by anything I do. The paint strokes now appear only inside the selected area. Thanks to the selection I made before painting, Photoshop allowed me to paint only inside my selected area. Even though I moved the brush well outside the boundaries of the selection as I was painting and made no attempt to stay inside the lines, none of the pixels outside of the selection outline were affected. They remained safe and unharmed no matter how sloppy I was with the brush, and I was able to easily paint over the apple without worrying about the rest of the image, all thanks to my selection! Any pixel inside of a selection outline can be edited, but nothing says you have to edit every pixel. The actual name of the Fade option changes depending on the last edit that was made. The Color blend mode allows us to change the color of an object without changing its original brightness values. Press Ctrl+H (Win) / Command+H (Mac) to temporarily hide selection outlines. Press it again to bring them back. 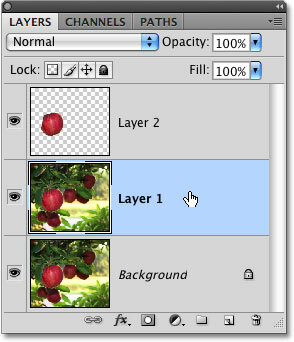 Up next, we'll look at another important reason for making selections - working with layers! Up until now, I've been making all of my edits directly on the Background layer, which is a very bad way to work because it means that I've been making changes to my original photo. If I was to save my changes and close out of the document window, the original image would be lost forever. Sometimes that may be fine, but it tends to leave a bad impression when you're forced to call up a client and ask, "Would you happen to have another copy of the photo you sent over? I sort of... well, hehe... I kind of ruined the copy you gave me". A much better way to work in Photoshop is to use layers. With layers, we can work on a copy of the image while leaving the original unharmed, and thanks to selections, we can even copy different parts of an image to their own layers so we can work on them independently! 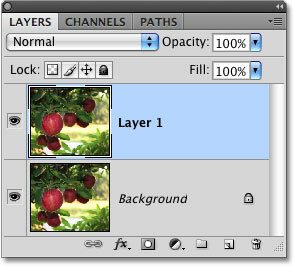 Without the ability to make selections though, layers in Photoshop would be nowhere near as useful as they are. The Revert command reverts an image back to its original state or to the last saved state. Creating a copy of the original image. Working on a copy of the image keeps the original safe. A selection outline appears once again around the apple. True to its name, the preview thumbnail gives us a preview of the contents of each layer. 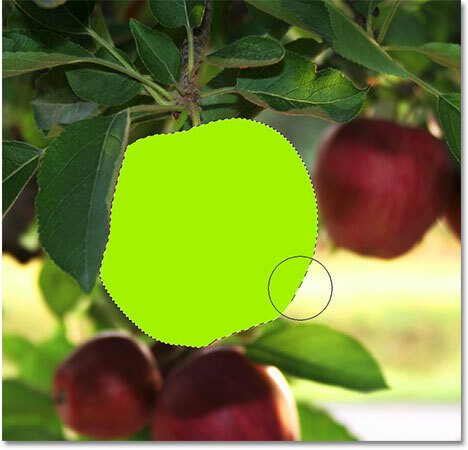 Any time we have a selection active when we copy a layer, only the area inside the selection outline is copied, which is why in this case, only the apple was copied. This ability to isolate a specific object in a photo and place it on its own layer is what makes layers so incredibly useful. If we couldn't select anything first, all we could do is make copy after copy of the entire image, which is usually about as pointless as it sounds. Selected layers appear highlighted in blue. 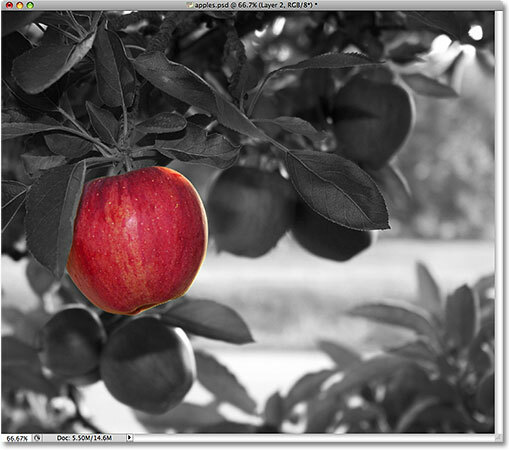 The Desaturate command is a quick way to remove color from an image. Only "Layer 1" has been desaturated. Combining selections with layers makes a great creative team. Of course, there's a lot more we can do with selections in Photoshop than just painting inside of them or copying them to new layers, but hopefully this gave us an idea of why selections are so important. Photoshop sees only pixels where we see independent objects, so we need selections as a way to bridge the gap between our world and Photoshop's world. And while layers can stake their claim as one of the biggest and best features of Photoshop, they owe more of their usefulness to selections than they'd probably care to admit. Now that we have some idea of why we need selections, how do we actually make them? We'll look at that next, beginning with one of the most commonly used selection tools in Photoshop, the Rectangular Marquee Tool! 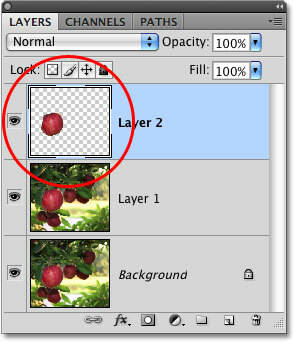 For more on making selections in Photoshop, see our How to make selections in Photoshop series. Or visit our Photoshop Basics section for more Photoshop topics!